WASHINGTON — Last week's bipartisan deal to push back some crucial September deadlines has given Congress some breathing room in a crowded calendar, but GOP leaders are now trying to maneuver through new and shifting dynamics as their frustration mounts over a lack of progress on key issues and a president who is increasingly opening his door to Democrats. After President Donald Trump sided with Democratic leaders to lift the debt ceiling and extend government funding alongside aid for Hurricane Harvey and other natural disasters, a once-looming Sept. 30 deadline has disappeared. This week, Republicans have returned to Washington with a positive public posture but also notably shaken by the uncertainty over how their legislative agenda, still loaded with must-pass and much-wanted items, proceeds. 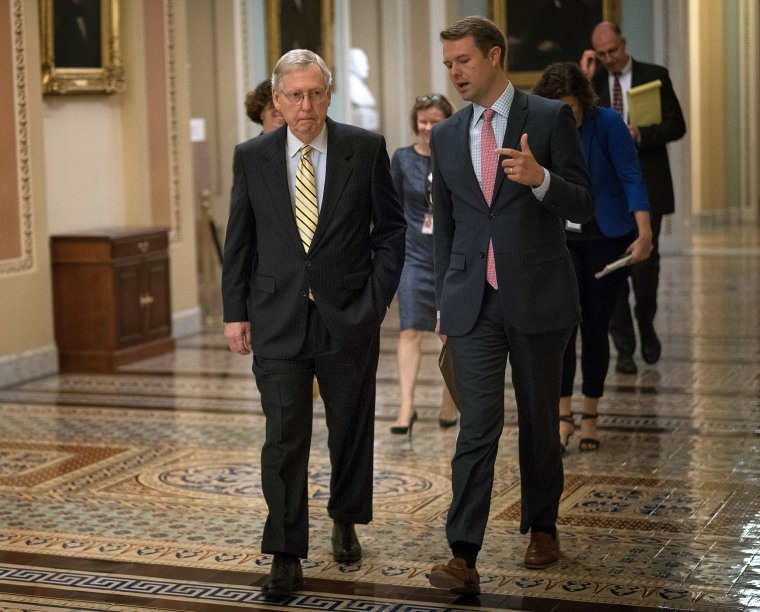 Senate Majority Leader Mitch McConnell, whose desire for a longer extension of the debt ceiling was rejected by the president last week, claimed that the deal Trump struck was good for Republicans. He told the New York Times’ podcast, “The New Washington,” that Democrats had “spiked the ball in the end zone a little too early” by celebrating the bargain. “Since I was in charge of drafting the debt ceiling provision that we inserted into the flood bill we likely — almost certainly — are not going to have another debt ceiling discussion until well into 2018,” McConnell said. It was an extensive explanation for the usually tight-lipped leader. McConnell said that Senate Minority Leader Chuck Schumer agreed, at the GOP leader's insistence, to include what’s called “extraordinary measures” to the debt limit deal, allowing the Treasury Department to rearrange its priorities to allow the debt limit to last longer. McConnell argued that by decoupling the deadline to fund the government, which is now Dec. 8, and to lift the debt limit, which McConnell says doesn't need to happen until next year, Democrats lose their end-of-the-year negotiating leverage. That wasn't the view of some Republicans at the end of last week when Sen. Ben Sasse of Nebraska said Schumer was in line to be “the most powerful” person in the country in December. And Republicans will still face another politically difficult vote on extending the debt ceiling, something that many GOP members oppose, before the 2018 midterm elections. Many congressional Republicans aren't blaming McConnell for the deal, but they are quietly upset with the president. “I think member frustration lies pretty squarely with the president, either because they think he is playing a game that only hurts our shared goals in the long run or because he made a snap decision without a firm understanding of the policy and the long-term consequences,” said one aide to a senior Republican senator. It’s unclear how or even if the deal will affect tax reform, the biggest legislative priority for Republicans. Despite McConnell’s insistence that tax reform is going to be a mostly Republican project, Trump is hosting a bipartisan dinner at the White House on Tuesday night to discuss the issue. Attendees include three vulnerable Democratic senators up for re-election in 2018: Joe Donnelly of Indiana, Heidi Heitkamp of North Dakota, and Joe Manchin of West Virginia. From the other side of the aisle, Sens. John Thune of South Dakota, Pat Toomey of Pennsylvania and Orrin Hatch of Utah were also scheduled to attend. Further unsettling Republicans are reports that Trump’s former adviser, Steve Bannon, plans to encourage primary campaigns against sitting Republican senators, including Dean Heller of Nevada, Jeff Flake of Arizona, Bob Corker of Tennessee, and Roger Wicker of Mississippi. When asked about the looming intra-party fights, senators tried to steer clear. And Sen. Cory Gardner, R-Colo., the head of the Senate Republican campaign arm, called Bannon’s efforts “a distraction."